Since blogging about it, I’ve had a few conversations about the notion of hefting as a useful way of thinking about place. Extending this discussion offers a nice way for me to flag up one of the Museum’s existing partners – Historypin – and an opprtunity to encourage others to add photographic content to the Historypin site. It is particularly worth trying out some of the site’s augmented reality tools, which allow the user to overlay historic images (using Google Street View) and thus enable viewers to effectively fade between past and present. In an earlier post I also mentioned the farm in Stadhampton where my mother grew up – Brookhampton – and how this is a place that I feel a strange sense of connection to despite my only having visited since the farmhouse and steading were demolished. 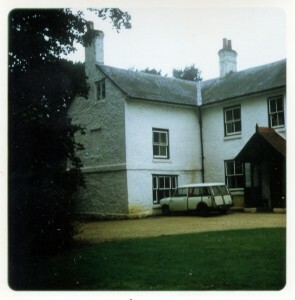 Historypin has enabled me to re-heft historic photos of Brookhampton, although I may need to consult family members in order to get the location exactly right! 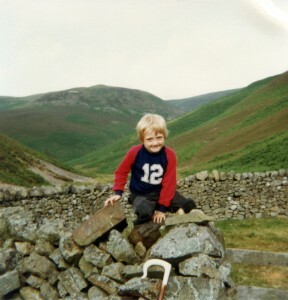 Given my predilection for the metaphor of hefting I thought it appropriate to ‘pin’ an image of me as a youngster to the map. If you follow this link you will begin to see some of the challenges of pinning rural images and artefacts to Historypin. Rural views and objects are not necessarily connected to places that are visible from Google Street View, or indeed to easily ‘siteable’ places at all. I got my image about as close as I can manage, near to the old ‘stell’ (or dry stone sheep pen) that it depicts. If you look at the satellite view of the map you will see that there are several of these old features very close by. Although I’m fairly sure I know which one of these I am seen climbing on, I still can’t locate it precisely enough. We hope to work closely with Historypin to begin to address some of the challenges that our project and the content it is generating might raise. We are also keen to begin pinning the museum’s artefactual collections to the places that they link to. Much like people though, objects have complex multi-sited biographies. The shepherd’s crook in the foreground of this picture is a perfect example of an artefact that is not only portable but is intended to be moved from place to place, offering a gentle reminder that outside of museum stores and displays, the things of everday life are not conveniently static! For those interested in the area surrounding where the image of me has been pinned, you will also see in satellite view that there is a reservoir not far to the west. This is the the old Kelso water supply. The sheep folds just to the east of where my portrait is pinned is known as Belsen. A shepherd who worked there shortly after the Second World War and who had been at the relief of Bergen-Belsen once came across the carcass of a sheep that had been left in the pen and forgotten about. He was heard to remark that the sight of this was ‘fair ******* Belsen’ and the folds has retained that name ever since. This story reminds me that there is more to place than just what we might see or the material links that we might have. The etymology and origins of placenames have a potent and valuable part to play in this discussion as well, not to mention the potential for places to gather negative as well as positive associations.